Silahkan klik tulisan atau gambar untuk lanjut membaca 45 Passengers of Sank-Off Boad is Save by Search and Rescue Team. TERNATE, LELEMUKU.COM - A team of the National Search and Rescue Agency (Basarnas) has managed to rescue 45 passengers after their boat sank off North Loloda isle, west of Halmahera Island, North Maluku Province on early Thursday. 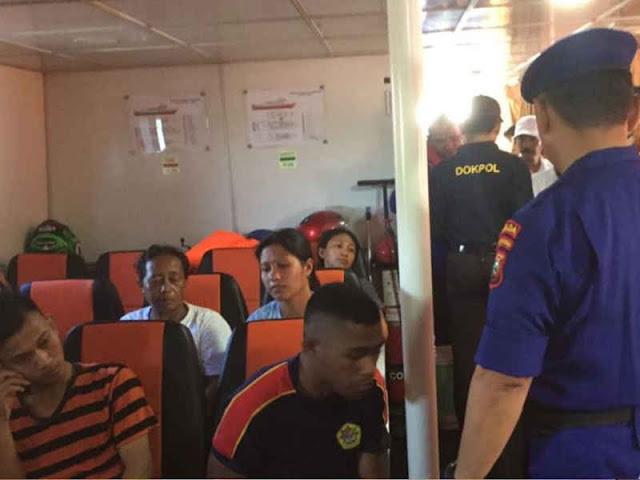 Forty five people were found safe and evacuated to Ternate in the rescue operation assisted by local fishermen and water police, Imelda Alini, corporate secretary of PT ASDP Indonesia Ferry, the company operating the ill fated boat, said in a statement. The survivors were passengers of MV Bandeng which lost contact on Wednesday (Aug 15) at 11 a.m. local time on its way from Tobelo in North Maluku, to Bitung, North Sulawesi Province.